There are times you discover amazing things and this is one of the times that I wanted to share with you. As a busy mom, one of the things I often skip in my daily routine is makeup. If I’m just grocery shopping or bringing the kids to school or ballet, I didn’t want to spend time putting on makeup. It wasn’t enough of a reason to go through all of the effort, products, tools, and brushes. Yet, I discovered three things recently that have changed my outlook. 1. 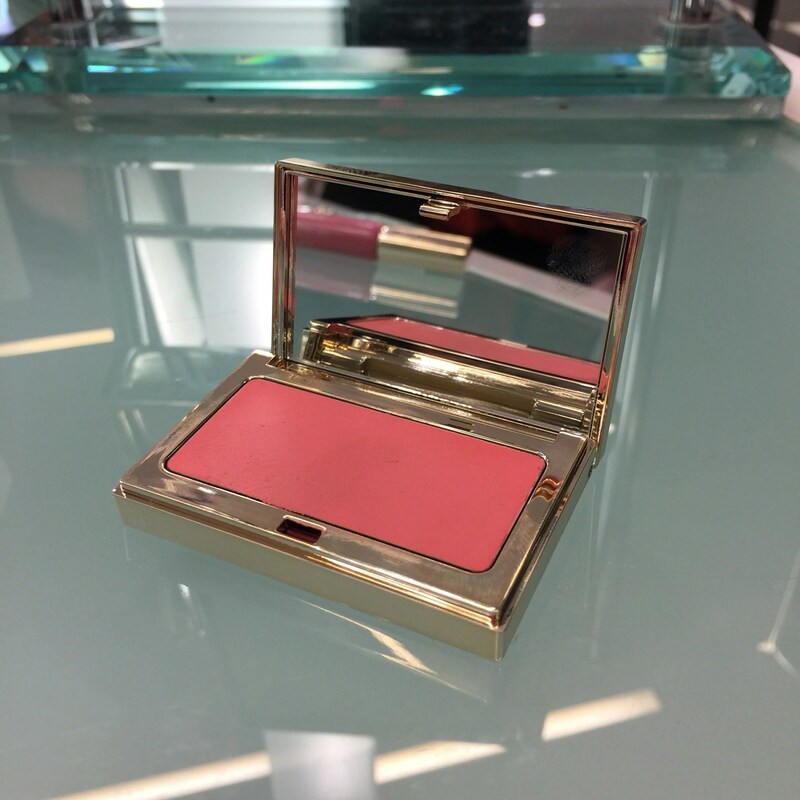 Clarins Multi Blush cream blush. This is a cream blush that you can use on your lips, cheeks and eyelids. It provides a consistent ‘palette’ of color, but it reacts differently on those areas of your face. Thus, each area has its own take on the color so it doesn’t look matchy but cohesive. You can also apply more on your lips, less on your cheeks to also provide variation. And all you need is your finger: to blend on your cheeks, dap on your lips and swipe across your eyelid. Add mascara and go. Yup. That’s it. Color on your face, one product, and super fast. 2. 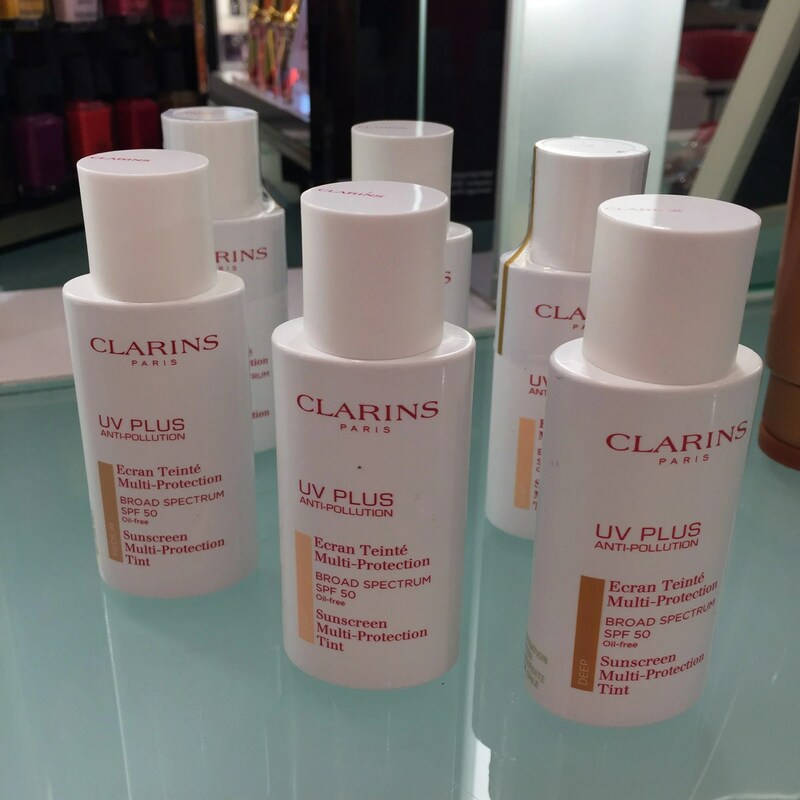 Clarins Sunscreen Tint. Sunscreen or foundation? Now you can have both. Swipe it on for sunscreen and pollution protection at a SPF50 level! (Not 15 or 20…50!) – so you are doing good for your skin. Then, with the added tint – it reduces redness and evens skin tone. A bonus! It applies as if you were using moisturizer so it is easy (and quick) to use. 3. Blue Orchid Face Treatment Oil. Sometimes I need more moisturizer so I slather on the heavy duty stuff (and then break out.) So I switch back to a lighter moisturizer and then my skin gets dry again. Add change of seasons to the mix and I have a bucketful of half-used moisturizers. 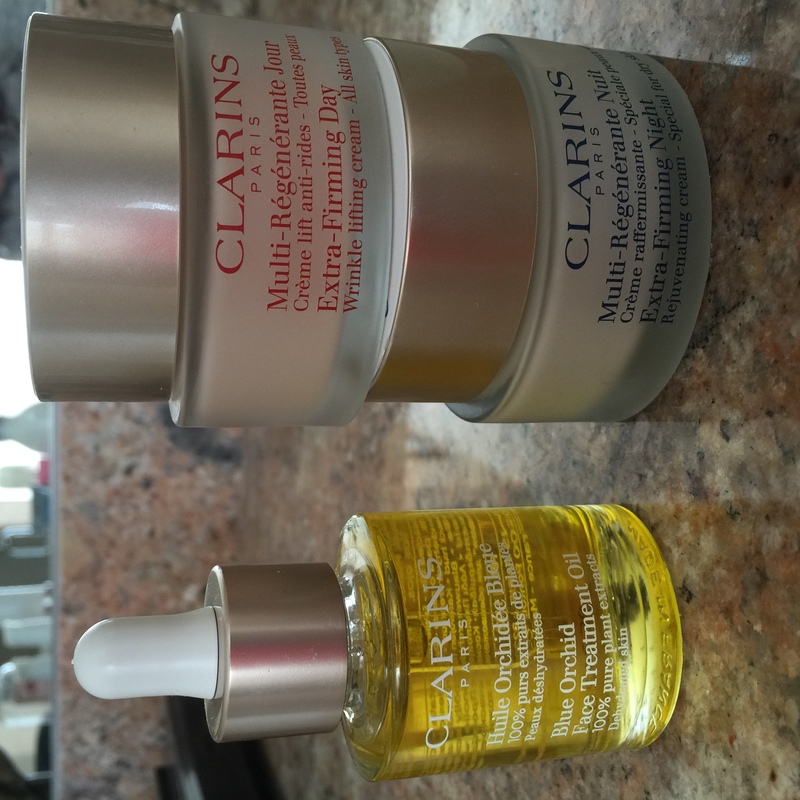 When Clarins told me about their Blue Orchid Face Treatment Oil, I was sold. The ability to use it alone, added to my existing moisturizer, and ability to control how much extra moisture to use (a drop, two drops, or three drops depending on what I need at the time) I finally feel like I am back in control! So I apply my moisturizer with the added oil, followed by the Clarins Sunscreen Tint, and then cream blush on my lips, cheeks and eyelids and I am done in less than two minutes with big impact. Plus, totally suitable for my athleisure lifestyle and look too. I’m now doing my makeup happy dance!